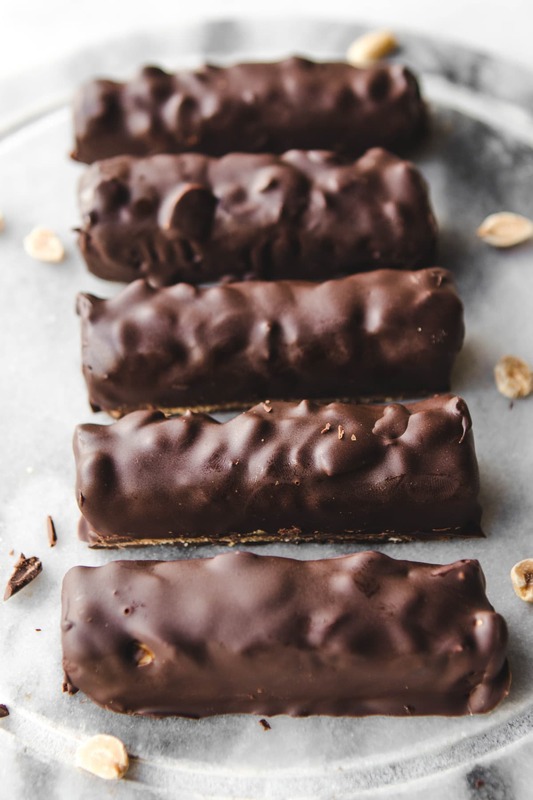 Vegan and Gluten Free, these Healthy Snickers Bars will satisfy any sweet tooth! Made with only 6 plant based ingredients, they’re easy to make and good for you too. 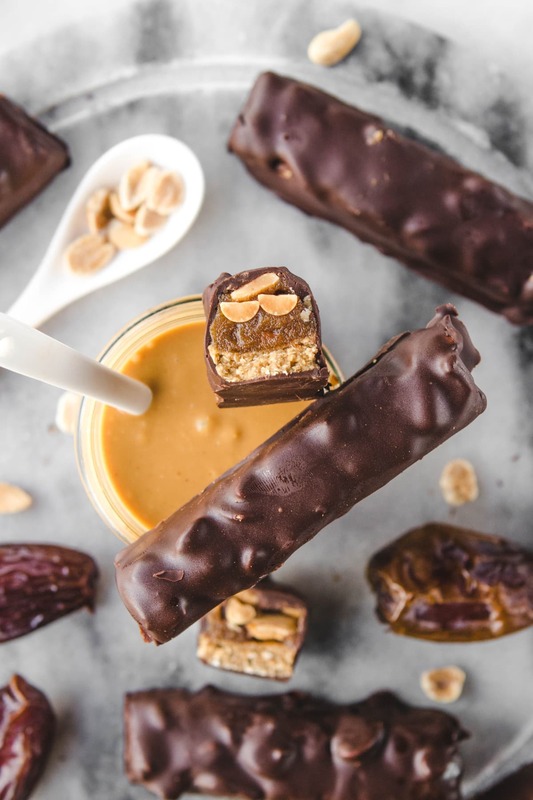 Making your own candy bars is actually pretty dang easy. The best part? There’s no preservatives, artificial colors, or any questionable ingredients. Oh yeah, and did I mention you only need 6 plant based ingredients to make these gems? (Well, 7 if you want to get fancy and add in the Maca Powder for extra caramel-y flavor, but they are still delish without). 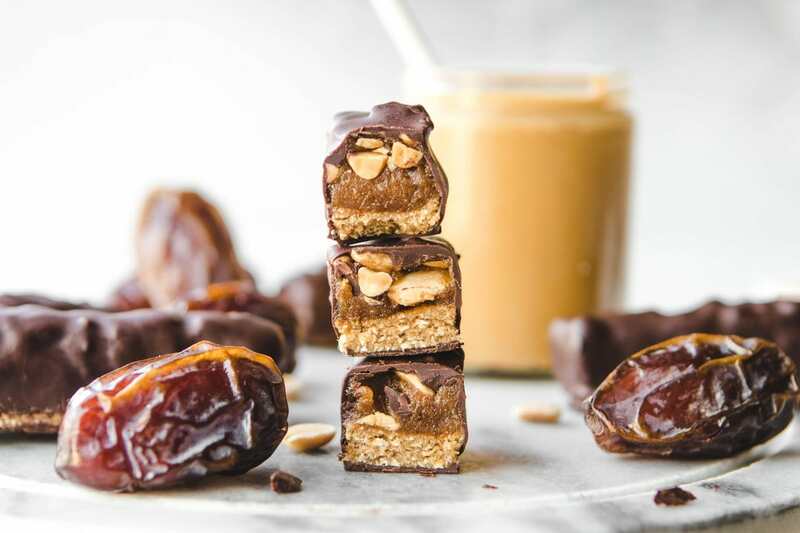 This recipe also only requires about 20 minutes of work on your end, and if you use Chocolate that’s sweetened with Coconut Sugar (like I did), they are also refined sugar free! 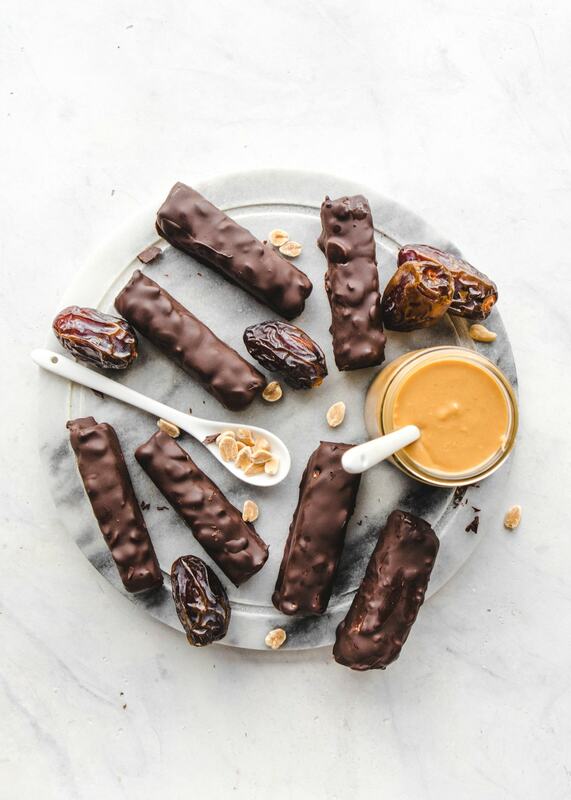 Honestly, I think anyone will enjoy these Healthy Vegan Snickers – kid, adult, vegan, omnivore, and probably pets too (if they didn’t have chocolate, which is bad for them. DO NOT feed them these bars!). They are addicting in the best way possible, and I hope you try them out soon. Leave a comment on this post if you end up loving them as much as I do! If you cannot eat peanuts due to an allergy or preference, you can substitute the PB with any nut or seed butter of choice – same goes for the whole nuts in the bars. Obviously the final result will taste different, but still be delicious! I would recommend Cashew or Almond Butter. It can be a little tricky to coat these bars evenly in chocolate if you use your hands. For best results, I recommend melting your chocolate in a bowl with a wide base (so the bar can completely sit on the bottom) and using two forks to rotate / dunk the Snickers. These bars are actually fine at room temperature and will not melt, but I would recommend storing them in the fridge or freezer so they last longer. If you store them in the freezer, let them defrost for a few minutes before serving. If you’re looking for more No-Bake Dessert recipes, you’ll also love these Vegan Cosmic Brownies and these Chocolate Turtle Cookies! Remove the pits from the Medjool Dates and pack them (really pack them!) into 1 cup. Transfer the Dates to a larger bowl and cover with hot water. Soak the Dates for 10 minutes (or just cover the Dates in water and microwave for 60-80 seconds if you want to be efficient). If you do not have Oat Flour, make some by blending a scant ⅔ cup of Quick or Rolled Oats in a Blender for 45-60 seconds until smooth and fluffy. Drain any excess liquid off of the Medjool Dates (they should be relatively moist, but not dripping) and add them to a food processor or high speed blender with the remaining ingredients for the Caramel. Process until thick and smooth, scraping the sides of the device if necessary. Remove the Date “Caramel” from the food processor. Add the Oat Flour to the food processor (no need to rinse) with ¼ cup of the Date Caramel and process until well incorporated. This should form a slightly sticky “dough” that will hold together when you pinch it. Firmly and evenly press the Oat Flour Nougat into a small and narrow container (see notes). Use a spatula to spread the remaining Date Caramel evenly over the Nougat, then sprinkle the Peanut Pieces over the Caramel. Use your fingers to press the Peanuts into the Caramel layer, so they stick. Place this in the freezer for 60-90 minutes, until firm. Remove the frozen “filling” from it’s container, then use a sharp knife to cut it into bar-sized pieces. Return these to the freezer while you melt your chocolate. Melt your Chocolate using either a double boiler or the microwave. If you choose to use the microwave, place your Chocolate pieces in a wide bowl (so the candy bars will fit along the base) and microwave at 30 seconds intervals, stirring in between. Once the Chocolate is 75% melted, stop microwaving and stir the mixture with a spatula until completely melted. Moving quickly, place 1 candy bar into the bowl of melted Chocolate. Use two forks to “flip” the bar, until it is coated in chocolate on all sides. Remove the ar from the melted Chocolate, letting any excess chocolate drip off. Then, place it onto a plate lined with parchment paper. Repeat with the remaining bars. Place the bars in the fridge for 5-10 minutes, to allow the Chocolate to harden. Serve and enjoy! Bars are best stored in the fridge and will last there for up to 10 days. You can also place them in the freezer, where they will last for up to one month – just let the bars thaw for 5 or so minutes before enjoying. The Maca Powder is optional, but adds an extra “caramel” flavor to the bars. I used a narrow silicone mold that actually came with my bento box to make these bars. However, you can use any narrow dish that you would like (such as a bread pan, or even a square or rectangular tupperware). If your dish is not flexible, I would recommend lining it with parchment paper before you add the filling layers into it, so they will be easy to remove once frozen. Your Oat Flour should be very fine (almost like regular flour) for best results. I recommend you use a Blender (not a Food Processor) and process for at least 45 seconds. I used this Chocolate (sweetened with Coconut Sugar) by Eating Evolved to keep these bars refined sugar free. If you do not care about this, feel free to use any vegan Chocolate Bar or Chocolate Chips of your choosing! You can also make your own 3 Ingredient chocolate following this recipe. It’s Sounds Yummy Yummy Delicious but it’s I’m Very Allergic to Caramel can’t U make without it inside of it ??? This is the best thing I have come across in recent memory. 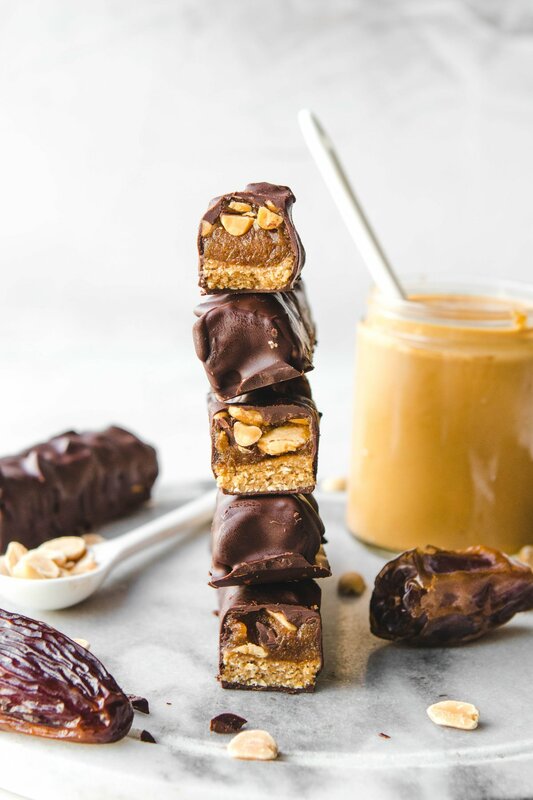 These healthier snickers bars look even better than the original!!! This tastes EXACTLY like a Snicker’s bar! I even gave one to my non-veg roommate and she loved it, and is asking me to make another batch ASAP! Thanks for this. Most recipes have a ton of coconut oil. Even without oil I still wouldn’t exactly call this healthy. Dates may be a whole food but they still have a ton of sugar. Maybe more like a decantant treat with slightly less calories than a real snickers and much better quality incredients? They actually taste better than snickers and are dang tasty…too tasty…I already had 2! What size was your baking mold? I ended up making mini bites using the silicon mold from my Ninja blender because the first container I tried was too big. Who the heck will buy snickers again after making at home?! Snickers company is going to go bankrupt haha. Could I use regular dates for this? Medjool dates are not as accessible here. Thanks for the great recipe! Yes, just make sure to soak them first so they are soft! Just found you on U tube the other day and had to make your Snicker bars as they seem so easy. Wow! Indeed, even better than the real thing. But, Snickers were never my fave candy, so please, please, make a Mars one! Thanks and I will keep trying your stuff, it will keep me busy during this awfully cold weather we have in the Netherlands. 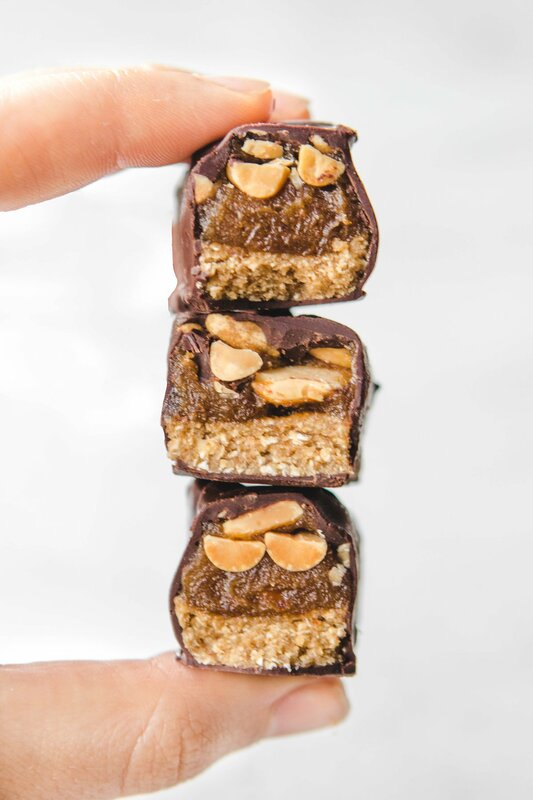 I just made these and was thinking how great this would be to make a whole food Mars bar! Mars were my favorite candy- they were like Snickers but with almond instead. 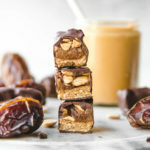 I think just switching out the PB for almond butter, and using slivered almonds on the carmel would be fantastic! It’s amazing how much the oats add to this. Thanks for making my day! I never comment on recipe blog posts but I thought I should for this one because it’s so incredible!! Easily one of my favourite things ever now! I made my omni friends try it and even they were floored. Oh my word! These ARE Snickers bars! I made them to take to a friend in another town, but I’m worried they won’t make it, heehee. Great job veganizing a classic favorite! Would lucuma powder work in place of maca? These look unbelievable!! Can’t wait to try them, wish I had a batch to eat right this minute as I’m super hungry! We just loved them!! !I just made them for the second time….in two days in a row….and I’m the only vegan in our family!!! !Thank you!!! What can you substitute for the oat flour? Would almond flour work? Can’t wait to make these!!! Hi Teresa! I have not tested this recipe using any other flours, but I think Almond Flour should be fine. Let me know if it works for you! 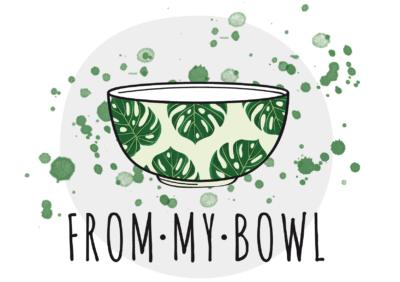 For some reason I rarely comment on recipe blog posts but I just HAVE to say THANK YOU! My parents always buy ice cream bars in the summer and my mom’s faves are the snickers one… I wanted to have my own version so I could enjoy it with them since summer’s coming up. And these are SO GOOD and so similar to the real stuff that after trying them my parents decided not to buy any this year… we’re just gonna make a whole bunch of these and freeze them 🙂 My family is opened to reducing their animal products consumption but there are certain things that they aren’t ready to give up completely so this is the kind of recipe that really makes a difference. Sorry for the long comment, but I thought it might make you happy ! Hey Helen, I have not tested this with date syrup, so I really can’t say! The fiber from the whole dates helps to add volume to this recipe so I don’t think it will turn out as well with the syrup. 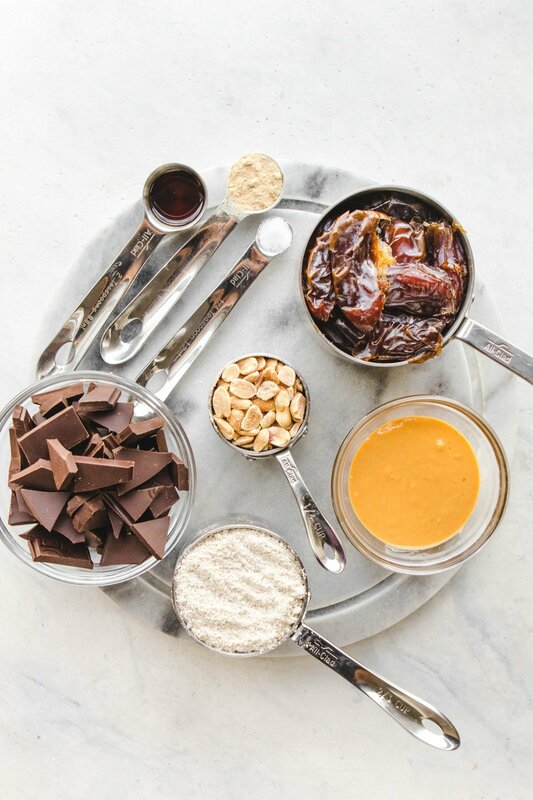 If you still want to try it, I would start with half of the amount of dates the recipe calls for, and go from there. Thank you so much, Ven! Giiiiirl, these bad boys are so dang good! I am harassed – HARASSED – by my coworkers to make them for work all of the time. This recipe is super forgiving as well. I add coconut sugar instead of maca, and it’s super good. I just made them and forgot to soak the dates, which messed up my nougat texture – I added a splash of hot water to the nougat in the blender, and it came out just fine. I’ve even made just the caramel once and made chocolate covered caramels with this recipe. STILL HECKIN GOOD! Ha! Thank you so much, Kelley! I love this review 🙂 and I’m glad your coworkers are enjoying the bars as well! You’re so very welcome, Sara! Hey Caitlin! These are amazing and it’s awesome that it’s guilt free 😋 do you roughly know how many calories are in one bar? Hi Holly – I do not calculate the nutrition information for any of my recipes, but there are plenty of free calculators online where you can figure it out yourself! How much calories in a small bar? Wow wow wow. This slice is seriously delicious. Even my husband has been scoffing it, and he’s not normally into raw slices. Friends have been asking for the recipe too. Thanks so much Caitlin! These look so good. Can’t wait to make them. Do you think i could use a cup of m maple syrup instead of dates? Gluten Free means no oats, wheat, barley or rye. How can oat flour can be gluten free? What could be substituted instead? Hi Stacey! I’m not sure where you live, but in the US you can purchase Gluten-Free Oats. I have had other readers substitute them with Almond Flour successfully though! My husband and I made these and love them! So good and satisfying, thank you for sharing. We just would add extra peanuts on top next time as a personal preference. Holy Moly! These are amazing!! So yum and will definitely make again. Snickers heaven. Wow this looks amazing! I see the bento box you posted has 3 sizes, did you use the small or large one for this? Thank you! I don’t usually rate things on the interweb but these bars were an absolute delight- vegan (I’m not), really easy (and enjoyable) to make with cheap, easy to find ingredients and they really are absolutely delicious. I made them for a party and LOADS of people were hugely impressed. If I change anything next time (and there will be a next time) I would up the amount of oats (to make flour), so there’s a slightly thicker base layer. YUM YUM.